Astonishing artwork inspired by Star Wars: A New Hope. Measures 15 1/2-inch tall x 12-inch wide. This astonishing artwork inspired by Star Wars: A New Hope is a must have for any Star Wars fan. The Star Wars Timeless Series Obi-Wan Framed Canvas Giclee Art Print is ready to hang on your wall as it comes framed in a brushed metal float frame. The canvas measures about 14-inches tall x 10 1/2-inches wide while the frame measures about 15 1/2-inch tall x 12-inch wide. The canvas print features artist Jerry Vanderstelt interpretation of Obi-Wan Kenobi. 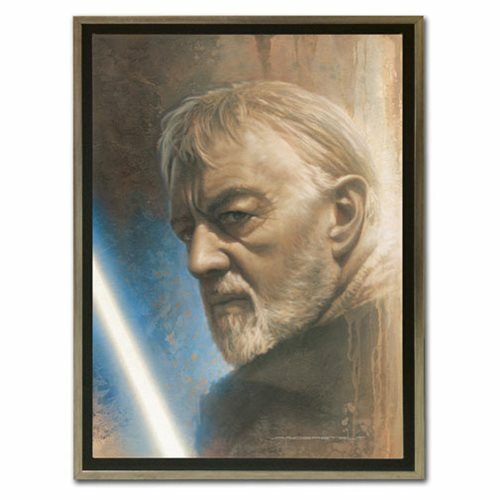 The Star Wars Timeless Series Obi-Wan Framed Canvas Giclee Art Print is limited edition of just 495 piece! A certificate of authenticity is included.